The soup is made by boiling the bejeezus out of a large quantity of chicken bones and chicken feet. These chilly winter nights beg for bowls of hot noodle soup, but there’s a certain sameness to the East Bay ramen scene — everyone doing their own take on the same handful of mostly pork-centric Japanese soup styles. 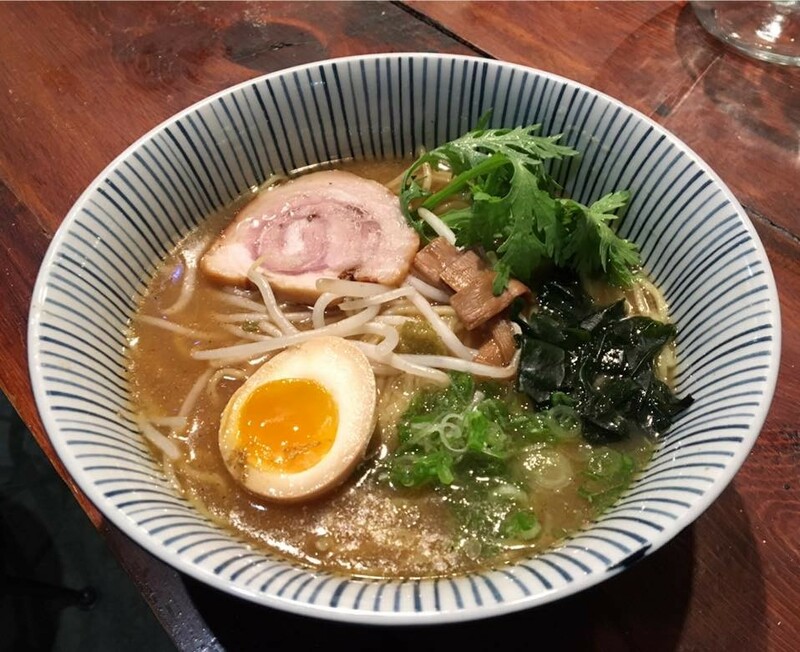 I was intrigued, then, to hear that AS B-Dama (907 Washington St., Oakland) is serving chicken paitan ramen, a style rarely seen in the East Bay, as a recurring weeknight special. Paitan translates as “white soup,” and refers to the cloudy, milk-white broth that results from boiling the bejeezus out of a large quantity of bones at a high enough temperature so that all of the fats and collagens in the marrow and cartilage break down and emulsify into the broth. Tonkotsu ramen, which is made with pork bones, is the most well-known example of this style — indeed, tonkotsu is arguably the most popular style of ramen in the United States. What you’ll see far less often is a chicken-based paitan ramen; in fact, the “White Bird” ramen at Shiba Ramen in Emeryville is the only other version I can recall eating in the East Bay. The version AS B-Dama serves is a collaboration between chef Asuka Uchida and line cook Allan Wan, who worked at Oakland’s Ramen Shop for three years before his current gig. Reached by phone, Wan explained that to make a chicken paitan, you take the same approach that you take with tonkotsu, simply substituting chicken bones and feet for the pork bones. The other ramen components were also on point — the noodles perfectly springy, the yolk of the marinated soft-boiled egg cooked to just the right creamy consistency. Soft seaweed, bean sprouts, green onions, and a handful of raw greens provided the finishing touch. Oh, and pork lovers need not fear. Even though the soup is entirely chicken-based, the paitan ramen comes with a thick slice of proper chashu (braised pork belly) — as soft and tender as any I’ve had, with a surprising prickle of citrusy yuzu kosho heat. Apart from the unorthodox addition of yuzu kosho chili paste right before the chashu is added to the bowl, Wan explained that the pork owes its depth of flavor to one of Uchiko’s guiding principles — to never, under almost any circumstance, cook with soy sauce. So, in a departure from the conventional wisdom, she braises the pork belly in sake and mirin (sweet rice wine), only adding the soy sauce to the braising liquid at the very end, and then allowing the cooked pork to marinate in the mixture. The best part is that at just $12, this is one of the best bowls of ramen you’ll find in the Bay Area — for a solidly middle-of-the-road price. AS B-Dama’s chicken paitan ramen is available in limited quantities — about 25 bowls a night — Monday–Thursday during dinner hours (5–10 p.m.). Often, though, it will sell out by 7 or 8 p.m., Wan said. Make your plans accordingly.